There’s a little one arriving in the next few weeks, and I am so eager to meet her! Baby Mine sweater from Socks That Rock Mediumweight. I’ve knit this sweater twice before, but out of Brown Sheep cotton Fleece. Knitting it with the suggested yarn was a whole new experience! With the Cotton Fleece I had to throw it in the dryer to get it to look right. This one? Nope, just soak and block and all is well. It really doesn’t get any better when it comes to knitting. At the end of February and all the way through March we get some rather funny weather. Yesterday it got up to 45F but dropped quickly in the evening. I’d planned a bike ride, and 7 other cyclists showed up to ride with me. We managed a 24 mile ride despite the chill in the air and the roads and trails icing over once the temperature dropped. Today? It’s snowing like mad, but doesn’t really look like it wants to stick around. But, I keep thinking that next week is March, and March usually means days here and there that are quite warm and pleasant comparatively. The easing into the next season. And I am looking forward to it. On our bike ride there were geese flying about, and we had a close encounter with a rather active skunk. I take all of these things as signs of a season change as well. And I enjoy the optimism of a sign at the end of winter. Today’s knitting update brings us to the third block of what is hopefully the last strip on my Lizard ridge. I have completed it. I really liked the yarn I chose for this block, as it is quite different from all the others. 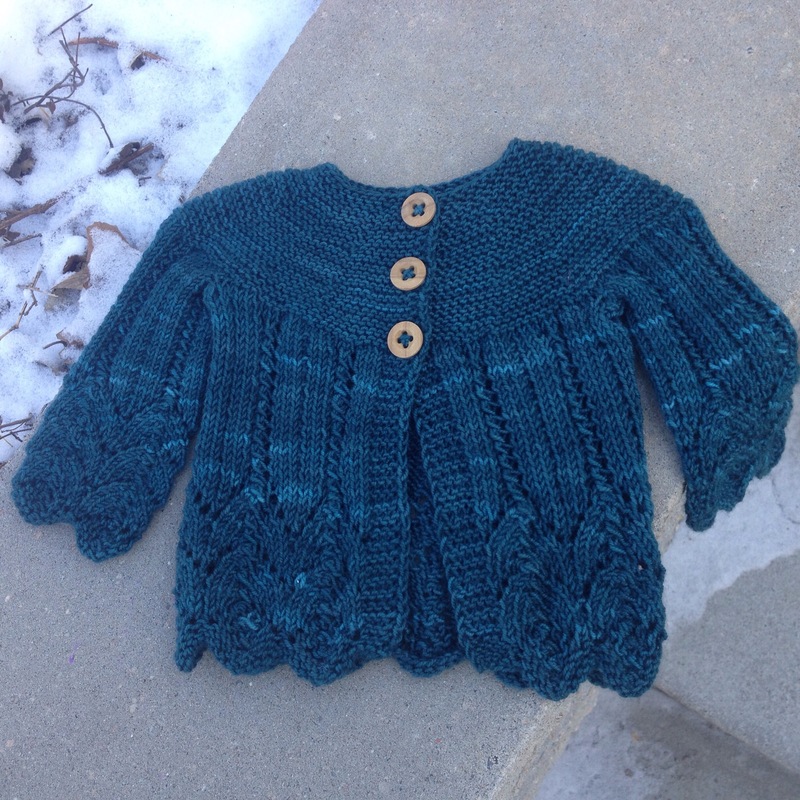 The baby sweater moves right along at a comfortable pace. But, Lizard Ridge is still my focus. I’ve got the actual blocks at work to knit on during lunch break. But at home, I am working on spinning my CVM Romeldale fleece into a yarn that can be used for the border. 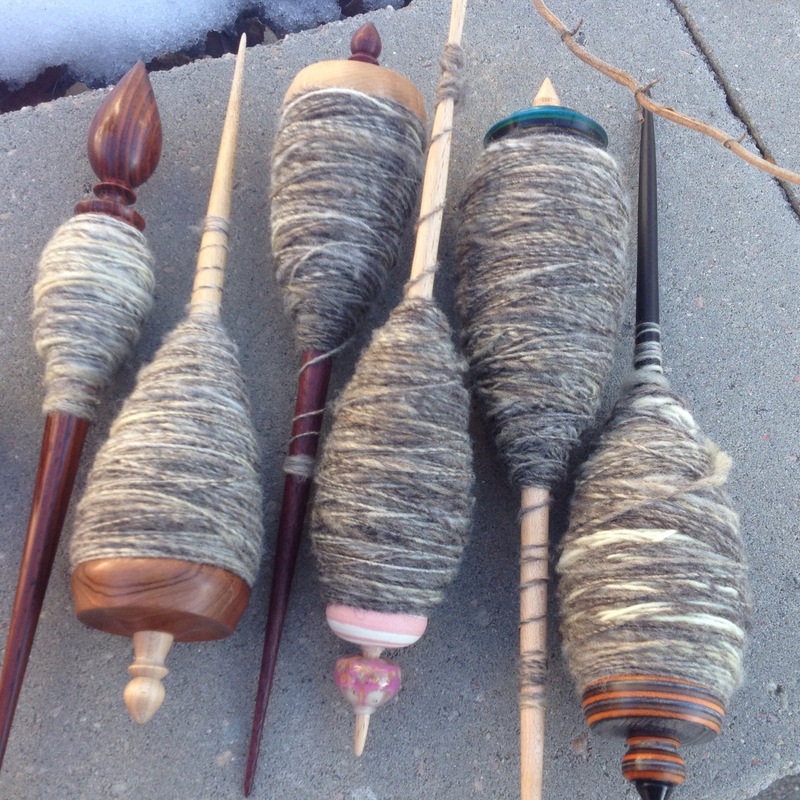 I decided that this week I’d spend spinning singles on my support spindles, only to spend the upcoming weekend plying. Hopefully I’ll have two decent skeins of yarn to show for it. Speaking of spinning, I just picked up a new spindle. It’s from MissingSpindle on Etsy. This one has both a pottery whorl and a lampwork whorl that can be used together or separately. You can get just the lampwork portion at glassbead on Etsy if you were so inclined. The one I purchased is meant to be a drop spindle, used in conjunction with a half hitch at the end of the yarn. However, I am using it entirely as a support spindle and it spins so beautifully! I am just absolutely over the moon for this spindle. I purchased it because it was new to me, and interesting because of that. But, I admit I didn’t really expect to fall head over heels for it. But I did! So, check out those options if you are a support spinner. It’ll be well worth your time. I do believe my hands are still recovering from marathon sock knitting. They’ve been waking me up at night by falling asleep. It gets quite painful, and really, that’s one of the reasons I quit knitting socks in the first place. While I’ve been working on other projects, I know what I really need is a day or two off. So yesterday I spun exclusively. I kept working on my CVM/Romeldale fleece for yarn to use as the border of the Lizard Ridge blanket. After filling a spindle, I decided to make a 3 ply and see how it turned out. 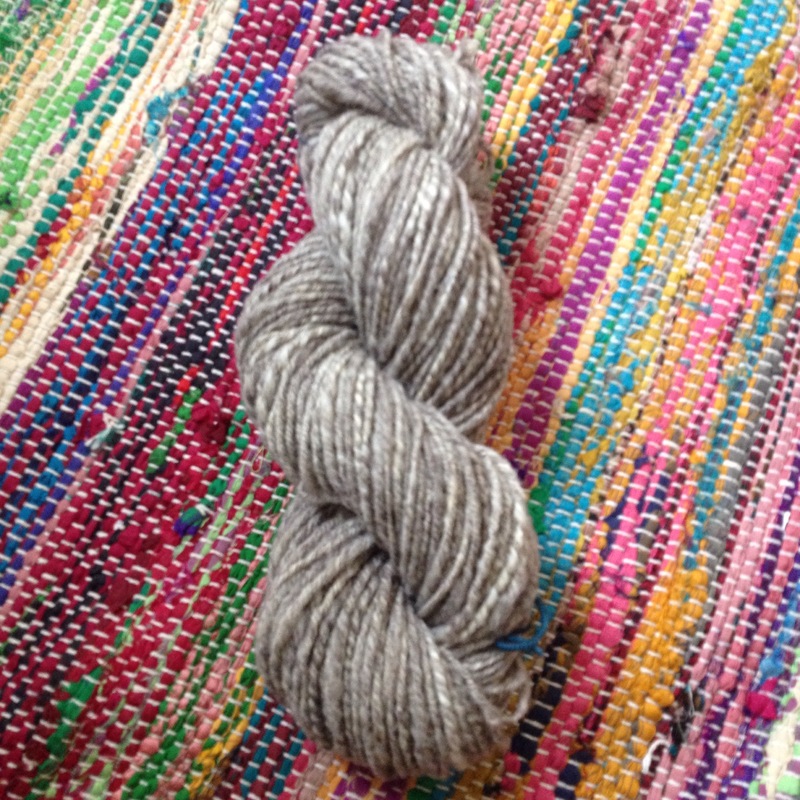 It’s quite bouncy, and these 130 yards of 3 ply totally filled my majacraft bobbin. I do love a semi solid, and this is just a most lovely fleece. I am truly enjoying the process. I also went to a fiber themed art exhibit, and on a bike ride with Mr. Ink. It was lovely. The day was far colder than expected, but it was pleasant to spend time chatting and catching up away from the house project and all by ourselves. Once we got home, I insisted that he allow me to grab a shot of his new socks on his feet. I think they look wonderful!I am eager to find out how he feels about them once he really has an opportunity to wear them. We’ve had house projects and out of town company for the last two weeks. It’s been extremely busy, and very low on quiet time for introverts like Mr. Ink and me. Not that we haven’t enjoyed it, and not that we haven’t been extremely productive. But, we still need a little down time, and we haven’t managed to squeak much of that in lately. Bug went to her dad’s last evening. This morning I had a massage scheduled, but it was canceled last evening. I admit, I was really happy about the cancellation, as what I truly wanted was to hang around my house all alone. And that’s what I got to do! This morning saw me up early with a cup of coffee or two and some spinning. All of the knitting I’ve done lately has my hands in bad shape again, so I figured I’d give them a break while working on my lizard ridge blanket. The two balls of singles were spin ages ago. We are talking years at this point. 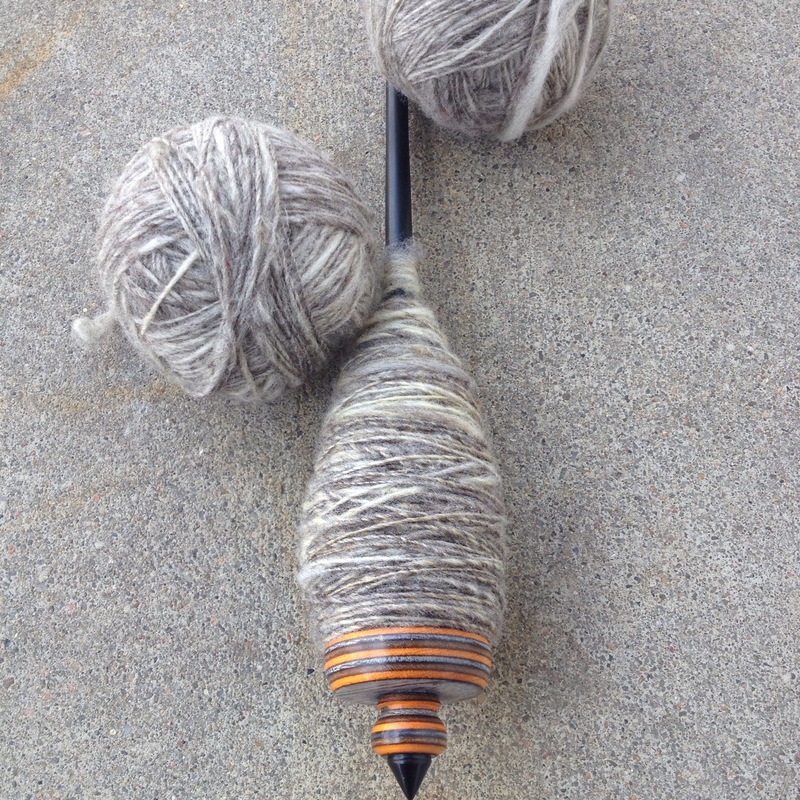 I had made some traditional rolags on my hand cards and spun them up just to see what happened. They turned out beautifully, and I had a plan for the yarn, but the plan got lost in the process of dyeing and flick carding more of the CVM Romeldale fleece that the singles are from. So they sat in that form for ages. 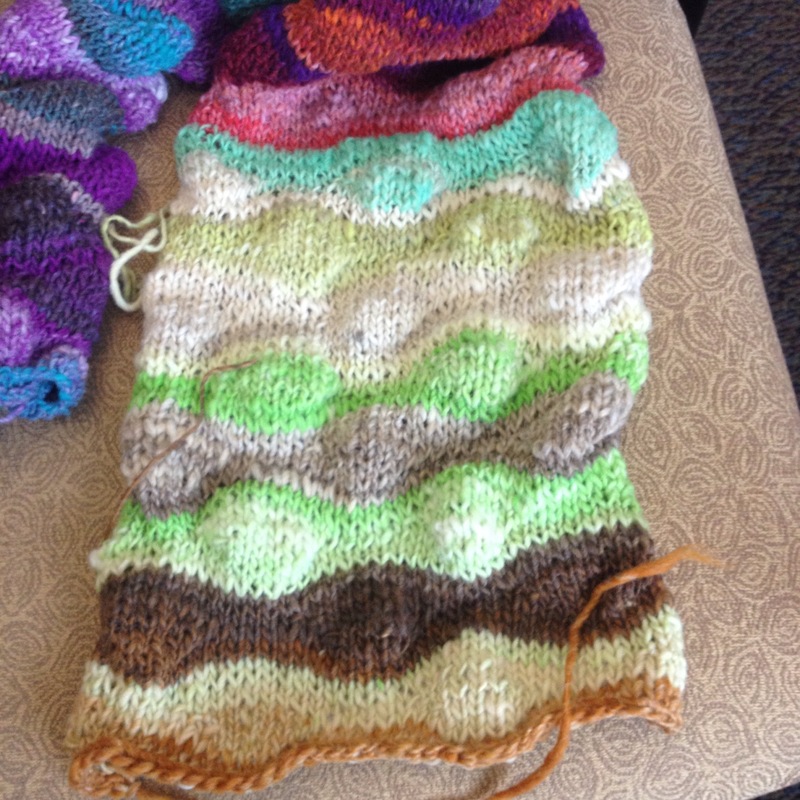 I think I am going to need a 3 ply yarn for the lizard ridge border, in order for it to be thick enough yarn to match the Noro Kureyon. I am now spinning from the flicked lock, as it works just as well as the rolags, though the colors probably won’t be quite as well blended. I am not entirely sure if I should do this as a 3 ply or 4 ply, but I am going to do a test skein in 3 ply because my guess is that it’ll bloom like mad once it’s washed and fulled. You might notice the new support spindle! It’s a Silly Salmon Designs, and I traded some fiber from my stash for it when Ms. Marja decided she didn’t fall in love with it appropriately. 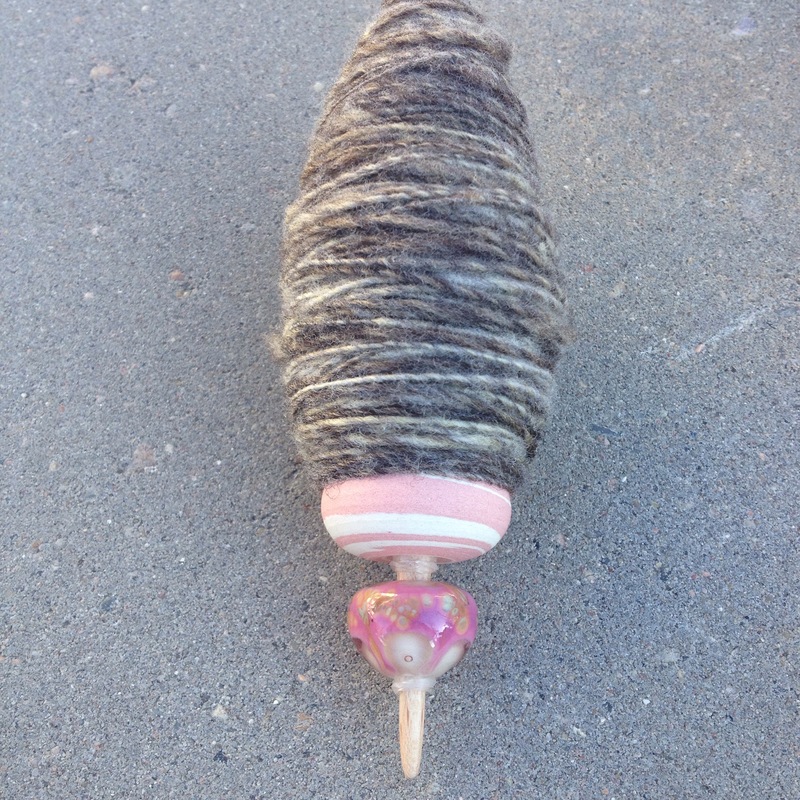 I am totally in love with it, as I am with my other Silly Salmon support spindle. It just spins and spins, and holds a ton of yarn beautifully. 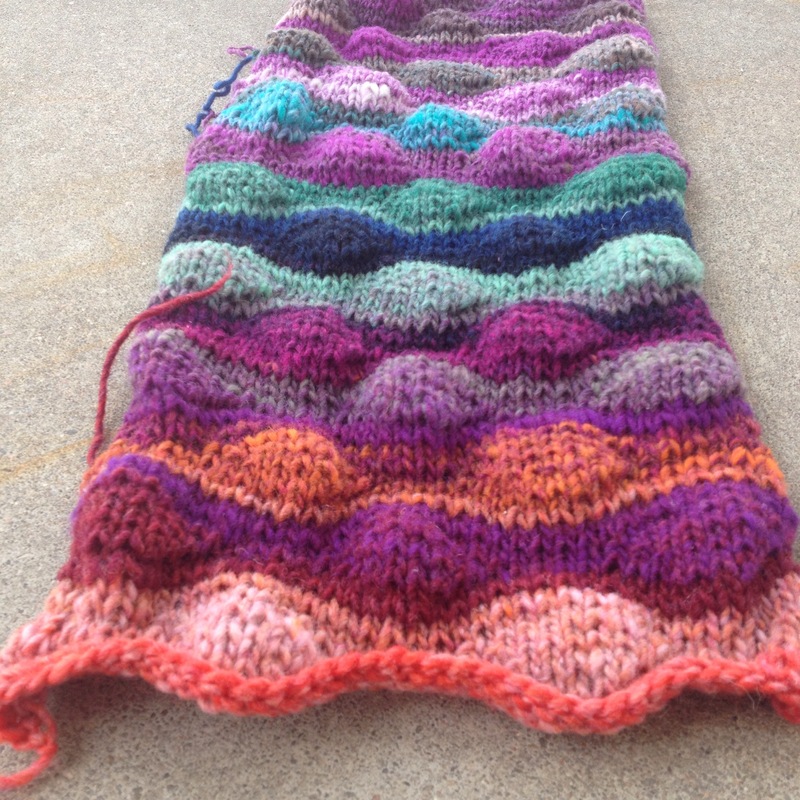 I also have another block done on what I am hoping is my final Lizard Ridge strip. Looking at my remaining skeins, it seems like the tones of this strip are going to lead toward purple, which is kind of fun. I have another fabulous project on the needles, which I’ll show you tomorrow, so this project is kind of being worked on in bits and pieces. Spare time, when I need something fairly mindless. But, I remain highly motivated about it! 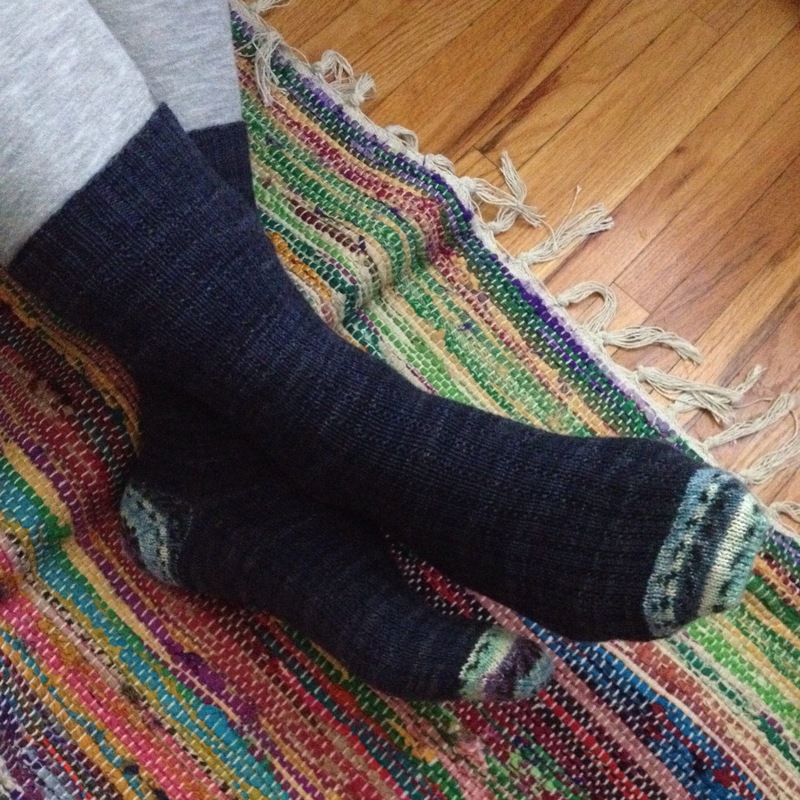 I’ve worked very hard to finish Mr. Ink’s socks this week. I’ve worked on them exclusively. I’ve worked on them until I created a blister on my index finger. And still I worked on them, just moving around that blister. Last night while taking a break from the house stuff, we watched a movie together and I knit on his sock. By the time the movie was over, I had finished the leg of the sock, and picked out the stitches for the afterthought heel. 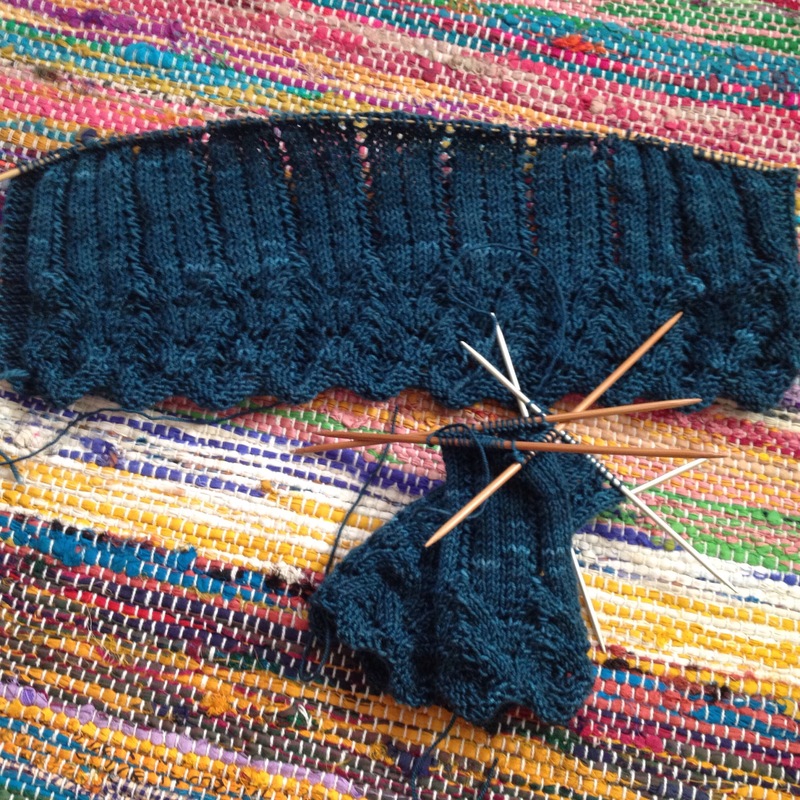 This morning before work I had already started the heel, adding in one of the short row gussets. Lunchtime at work brought me even closer to the finish line, and once I got home, all that was left is a few rows, a kitchener, and some weaving in ends. Sadly, I won’t see Mr. Ink’s feet to get a picture of the socks on feet until tomorrow. 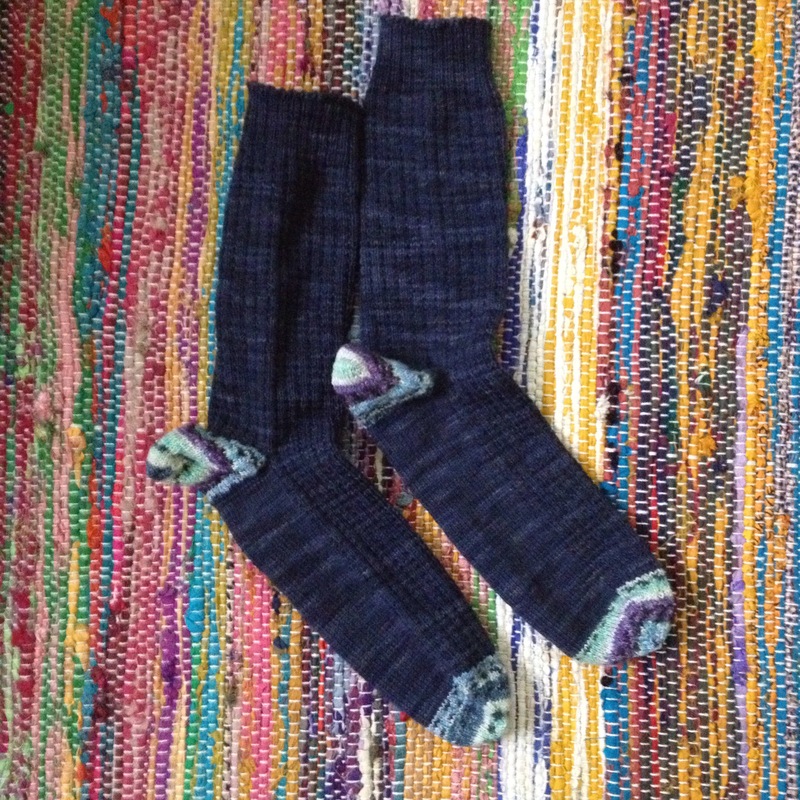 So, all I can give you today is a picture of completed March socks. I admit though, I am ridiculously excited to get started on Something Else. Anything else. I’ve got a secret project to knit. I’ve got a couple baby hats to knit. And, I intend to get right back into working on Lizard Ridge.